Now, any organization with a limited IT staff and budget can quickly and inexpensively create a highly-secure wireless LAN (WLAN) with ZoneDirector 3000. Capable of centrally managing up to 500 ZoneFlex 802.11g and 802.11n Smart Wi-Fi access points (APs), ZoneDirector 3000 is designed for ease of use, high performance, and low cost of ownership. Ruckus Smart Redundancy ensures high network availability and is easy to use with automatic synchronization of configuration and authorized users between ZoneDirectors. 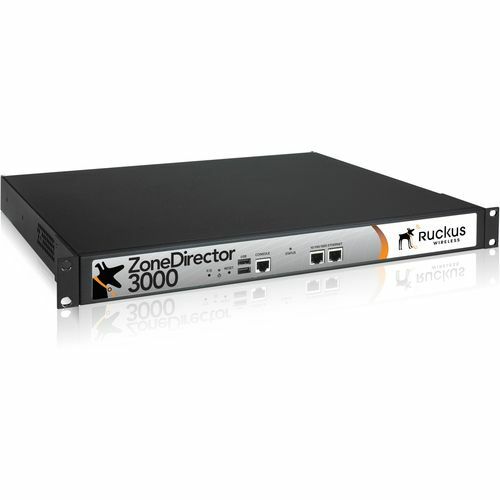 ZoneDirector 3000 integrates seamlessly with existing switches, firewalls, authentication servers, and other network equipment, and can be placed within any Layer 2/3 network. All Ruckus ZoneFlex APs (wired or meshed) then automatically discover ZoneDirector, self configure, and become instantly manageable. What could be easier? Nothing. Once ZoneDirector 3000 is up and running, it automatically manages ZoneFlex APs, adjusting transmit power levels and RF channel assignments to prevent adjacent APs from interfering, and providing redundant coverage if an AP fails. Configuration changes can easily be applied to multiple APs, or to the entire system, simultaneously. A customizable dashboard provides instant access to client and network information and events, and a real-time heat map displays AP locations and signal coverage, as well as Smart Mesh Networking topology.